A disturbance in the monsoon trough has quickly organized today. It has now strengthened enough to be classified as a tropical depression. We believe that NHC will shortly classify the system officially. As of 8:00 pm edt / 5:00 pm pdt unofficial tropical depression 3E was centered at 13.5°N / 96.5°W or about 150 miles south of Puerto Angel. Movement is to the west at about 8 mph. Top sustatined winds are estimated at 30 mph. The main threat is heavy rain to the southern coast of Mexico. 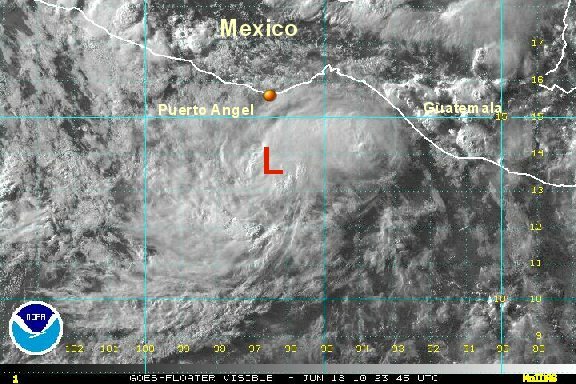 Convection building near "tropical disturbance"
The disturbance has gained a little more organization overnight with convection building near the center of circulation. some heavy showers are now on the coast of southern Mexico, but most of the unsettled weather remains offshore. As of 6:00 am edt / 3:00 am pdt unofficial tropical depression 3E was centered at 12.8°N / 97.0°W or about 200 miles south of Puerto Angel. Movement is to the west about 6 mph. Top sustatined winds are estimated at 30 mph. NHC skipped the tropical depression stage and went straight to tropical storm Celia as organization continues. Top sustained winds of 40 mph estimated. We are in agreement with this wind speed. Next full update will be later today. As of 4:00 pm edt / 1:00 pm pdt tropical storm Celia was centered at 12.6°N / 98.0°W or about 235 miles south southwest of Puerto Angel. Movement is to the west southwest about 5 mph. Top sustatined winds are estimated at 45 mph. Wind shear is expected to be low, so Celia should continue to strengthen as it moves away from Mexico. It may reach hurricane strength in the next 24-36 hours. As of 8:00 am edt / 5:00 am pdt tropical storm Celia was centered at 12.6°N / 98.0°W or about 325 miles south of Acapulco . Movement is to the west 8 mph. Top sustatined winds are estimated at 65 mph. Wind shear is expected to remain low, so Celia should continue to strengthen as it moves away from Mexico. It will likely reach hurricane strength in the next 24 hours. The main threat is now high surf to the southern coast of Mexico. Celia will continue to move away from Mexico. 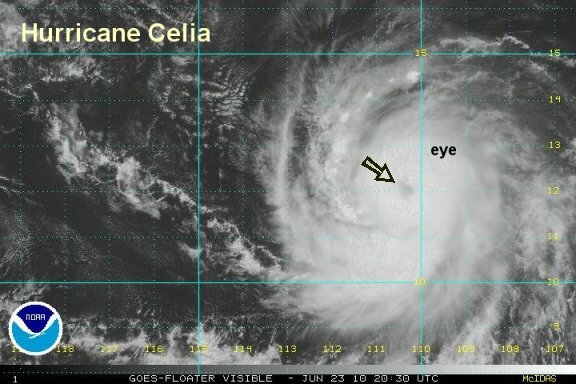 After moving west southwest, Celia is now on more of a westerly course. Wind shear has remained low so continued strengthening is likely. Seas up to 18 feet are possible near the center of circulation. Other than high surf, the effects of Celia will be minimal on Mexico. 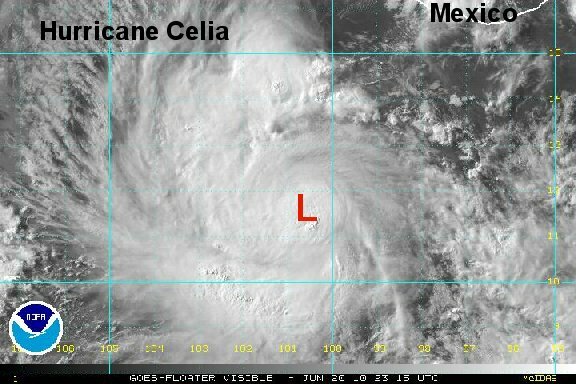 As of 8:00 pm edt / 5:00 pm pdt hurricane Celia was centered at 11.7°N / 100.7°W or about 355 miles south of Acapulco . Movement is to the west 8 mph. Top sustatined winds are estimated at 75 mph (NHC 75 mph). Satellite imagery shows that Celia has changed little overnight. In fact, convection is mostly on the southside of the circulation. It is possible that Celia is not a hurricane. We will stick with 75 mph for the sake of continuity, but a better wind estimate may be 70 mph. NHC has estimated 80 mph with Dvork technique. The partial eyewall from last night is gone, so we're sticking with a lower estimate. As of 8:00 am edt / 5:00 am pdt hurricane Celia was centered at 11.8°N / 102.2°W or about 385 miles south southwest of Acapulco . Movement is to the west 9 mph. Top sustatined winds are estimated at 75 mph (NHC 80 mph). Celia has shown the presence of an intermittent eyewall today. Deep convection has also expanded. Despite this we are estimating 80 mph - a little under the hurricane center's wind estimate of 90 mph. With 90 mph sustained surface winds, gusts should be in the vicinity of 105-110 mph....that looks too high. Additional strengthening is likely tonight and tomorrow. 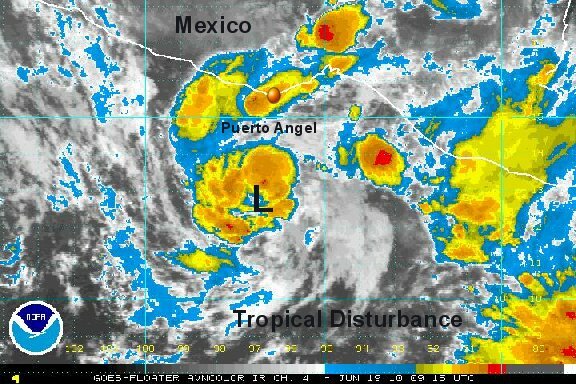 As of 8:00 pm edt / 5:00 pm pdt hurricane Celia was centered at 11.7°N / 103.6°W or about 515 miles south of Manzanillo. Movement is to the west 9 mph. Top sustatined winds are estimated at 80 mph (NHC 90 mph). Celia has strengthened some overnight based on satellite interpretation. We are not "feeling the love" that NHC is showing with 105 mph estimate. Satellite imagery shows recent cloud top warming plus, it looks like the eyewall is not nearly as organized on the west side as opposed to the east side. Because of this, we are not going to give Celia as high a Dvorak intensity estimate as the hurricane center did. Again, with a 105 mph estimate the gusts should be 15-20% above that or about 120-125 mph. A 90 mph estimate gives gusts up to about 105 mph. 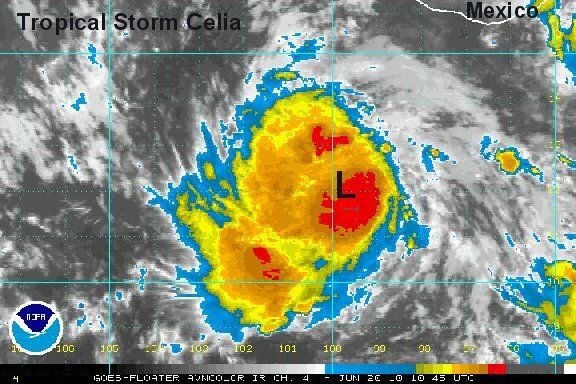 As of 8:00 am edt / 5:00 am pdt hurricane Celia was centered at 11.8°N / 105.0°W or about 505 miles south of Manzanillo. Movement is to the west 9 mph. Top sustatined winds are estimated at 90 mph (NHC 105 mph). The main threat is high surf to the southern / western coast of Mexico. Celia will continue to move away from Mexico. Satellite imagery showed an impressive eye that had formed and become visible. Clouds have now built over the eye again. NHC and our estimate have now coincided at 100 mph. 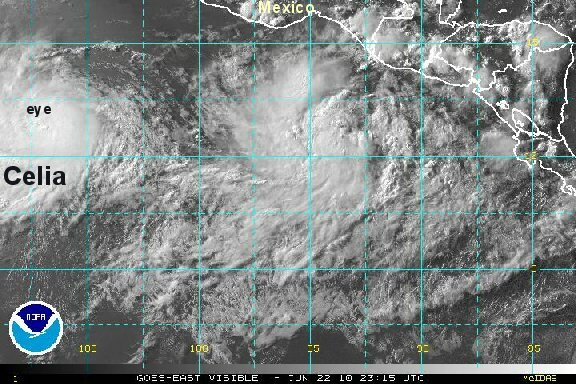 As of 8:00 pm edt / 5:00 pm pdt hurricane Celia was centered at 11.8°N / 106.7°W or about 525 miles south southwest of Manzanillo. Movement is to the west 11 mph. Top sustatined winds are estimated at 100 mph (NHC 100 mph). I.R. 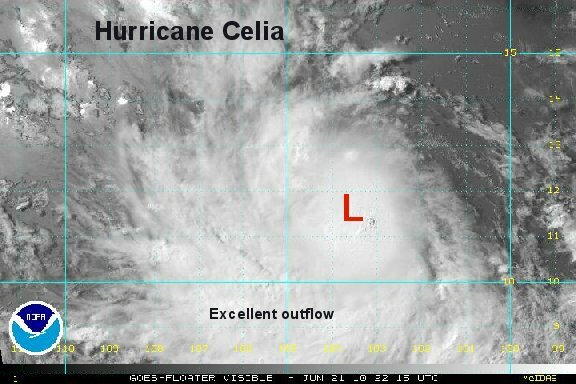 satellite imagery showed that the northern side of Celia's structure was dispurpted last night, hence its weakening. It appears that the easterly shear is lessening again so another resurgence is probable today. Celia will continue to move away from Mexico as a mid level ridge guides it westward. As of 7:00 am edt / 4:00 am pdt hurricane Celia was centered at 12.0°N / 108.4°W or about 760 miles south southeast of Cabo San Lucas. Movement is to the west 10 mph. Top sustatined winds are estimated at 85 mph (NHC 85 mph). 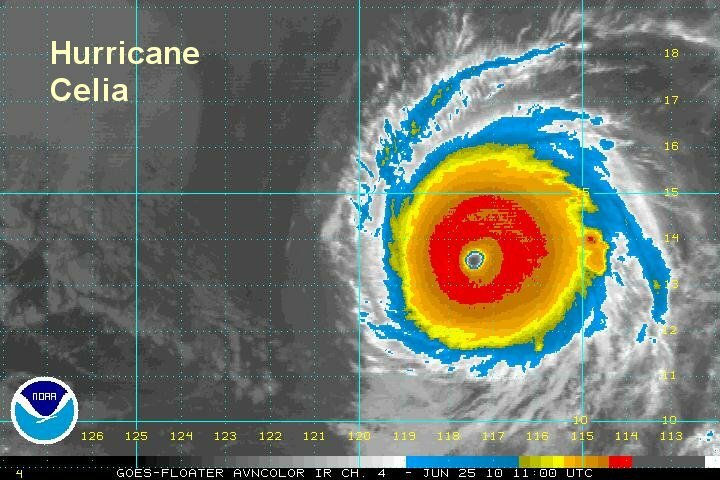 Hurricane Celia has strengthened rapidly today. 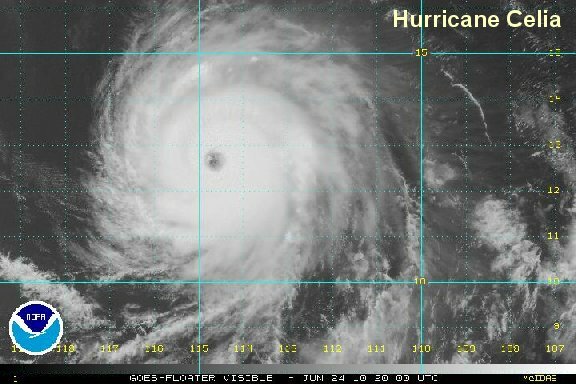 The eye structure is the most impressive so far. The southern side of the eyewall is the strongest. The strengthening phase may continue into tonight or tomorrow. Eventually in a few days, Celia will be farther from Mexico over colder water and weaken. Celia is not a threat to Mexico. 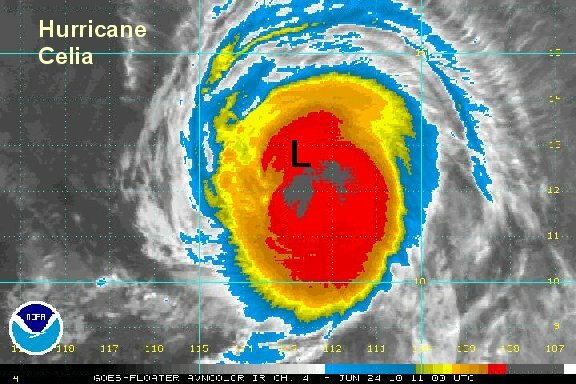 As of 5:00 pm edt / 2:00 pm pdt hurricane Celia was centered at 12.3°N / 110.4°W or about 730 miles south southeast of Cabo San Lucas. Movement is to the west 13 mph. Top sustatined winds are estimated at 115 mph (NHC 115 mph). 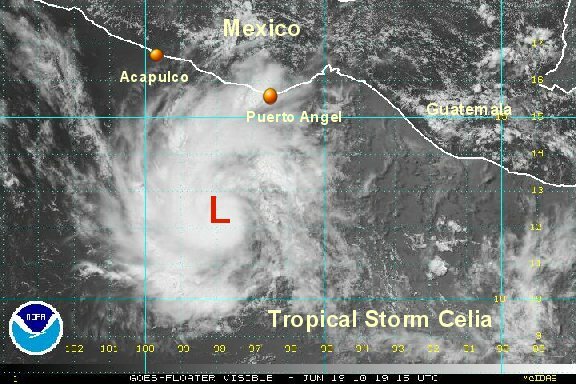 Satellite imagery showers that Celia is a farily sizeable tropical weather system. The structure of Celia is not as impressive as last evening, so we believe that it has weakened a touch. The deepest convection is also shifted to the southeast quadrant of the circulation, another reason for us downgrading a touch. As of 7:00 am edt / 4:00 am pdt hurricane Celia was centered at 12.6°N / 112.9°W or about 740 miles south southwest of Cabo San Lucas. Movement is to the west northwest at 13 mph. Top sustatined winds are estimated at 105 mph (NHC 110 mph). Hurricane Celia has undergone rapid deepening today. It is a large system now characterized by a large eye and is displaying excellent outflow aloft. 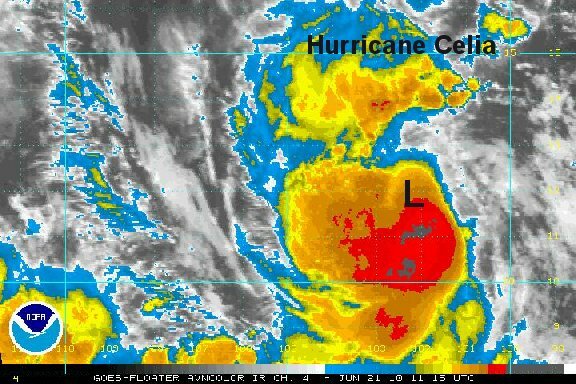 As of 5:00 pm edt / 2:00 pm pdt hurricane Celia was centered at 12.8°N / 114.7°W or about 765 miles south southwest of Cabo San Lucas. Movement is to the west northwest at 12 mph. Top sustatined winds are estimated at 140 mph (NHC 135 mph). 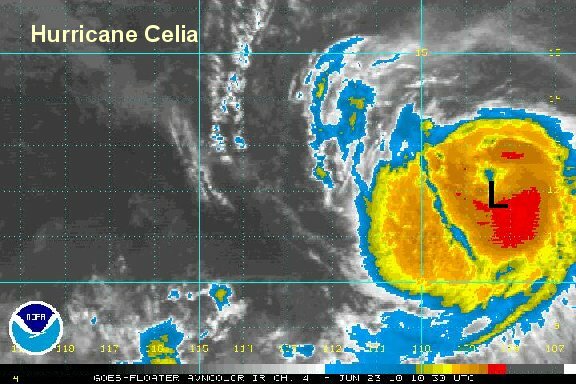 Hurricane Celia continued its strengthening trend overnight to a category 5 hurricane. As hurricane's get this strong, eyewall replacement cycles generally control their strengthening and weakening. Since Celia is continuing to head toward cooler water in the next day or two, we were possibly looking at it's strongest point last night. We think that Celia's eyewall is not quite as impressive as a little earlier and are going under a satellite estimate of a few hours ago of 155 mph. We believe that Celia may have reached 160 mph several hours ago, but is now a little less strong with an eyewall replacement cycle. Thankfully, Celia is a "fish storm" meaning it is well out to sea and not disturbing anything but fish. Celia is not a threat to Mexico. 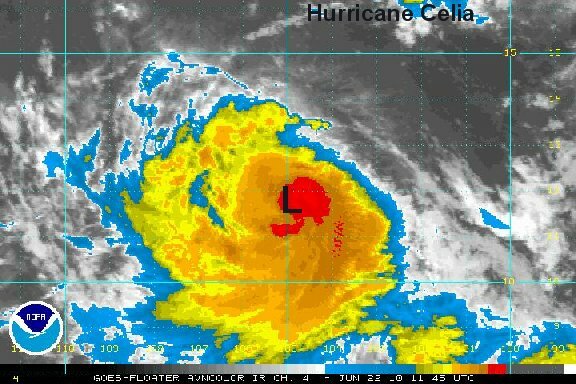 As of 7:00 am edt / 4:00 am pdt hurricane Celia was centered at 13.5°N / 117.2°W or about 800 miles southwest of Cabo San Lucas. Movement is to the west northwest at 13 mph. 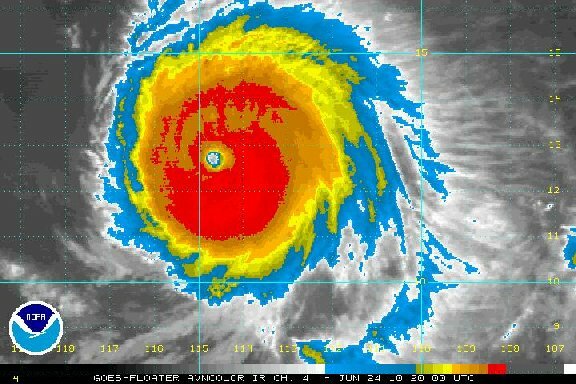 Top sustatined winds are estimated at 150 mph (NHC 160 mph).